The German luxury car maker Mercedes-Benz have given the Indian customers another flamboyant and lavish off roader, which was recently launched. This Mercedes Benz G Class G63 AMG is one of the most expensive and luxuriant SUVs from the stables of Mercedes-Benz. The Mercedes-Benz G Class model was first launched in the year 1970 as a vehicle that was to be used in the armed forces. The first civilian version of this stylish and charming Mercedes-Benz G Class model was introduced into the world market in the year 1979 and since then, it has been all the rage for SUV enthusiasts. This SUV has been through a number of changes and other makeovers in the period of the last two decades. The Mercedes-Benz G Class has been dubbed as the fastest SUV in the Indian market as its powerful engine enables it to break the speed barrier of 100 kmph in just about 5.5 seconds, which is rather thrilling. Now with this latest entrant that has been launched in the Indian car market, the company is expecting see a lot more sales of this SUV. The company has effected some changes to the exteriors as well as the power train along with the interiors as well. All these put together are being expected to increase the sales of this highly priced SUV among the Indian aficionados. The company has equipped this latest Mercedes-Benz G 63 AMG with a performance packed 5.5-litre bi-turbo petrol engine, which has 8 cylinders along with a whopping 32 valves in it . This power packed engine is skilfully mated with a 7-speed, G-tronic automatic transmission, which also has an improved AMG speed shift plus. The company has also equipped this Mercedes-Benz G 63 AMG with best in class comfort features; some of which include a powerful air conditioner unit with automatic climate control and air quality control along with rear AC vents, a multi functional power steering wheel that can be adjustable, front and rear power windows and many more such features. Apart from these, the company has also packed this SUV with some very crucial and significant safety features, which propels this SUV into the league of premium SUV’s. The upcoming G-Class will have an all-new body with plenty of updates and new details while still retaining that classic SUV stance. The new model is undoubtedly wider than the outgoing G-Class. Just take a look at the front grille and headlight area. The grille appears to be roughly the same width as before, but the area surrounding the headlights and the space between the lights and the grille is much wider. The angle of the hood in relation to the fenders seems to be the same, which should help it keep its image intact. This minor detail is a dead give-away as to the new G-Wagen’s added width. As for the AMG aspects of the G-Wagen, the front bumper is unmistakably taller than the bumper seen on the last G-Wagen test mule. The air intakes are larger, helping feed the high-strung V-8 with extra cooling and air flow. Of course, AMG-spec wheels are present and likely wrapped with supper performance tires sized in a road-hugging wide size. They will help the G-Wagen with cornering, especially when combined with the extra width including in new architecture.The one thing we do see missing is the dual exhaust tips protruding just ahead of the rear tires. Perhaps Mercedes is dumping the idea. Perhaps this test mule simply isn’t wearing them. Only time will tell. Mercedes-Benz has carried forward the similar tough and strong kind-of interiors on the G63 AMG as well. The last time when I had driven the G55, it was very much crude but the G63 gets several luxury frills. Several AMG touches have been added and even some luxury has been sprinkled on on the interiors. The centre console has some gizmo with a seven-inch screen and COMAND system as well. The speakers on the G63 are Harman Kardon and the instrument cluster is somewhat retro. The rich leather seats are super supportive. You can adjust the front seats to the minute detail and this is where the difference happens. There is support for lumbar and even sides. Despite the high ground clearance and quick direction changes, the seat grips you tightly, just like a bucket seat. There is AMG badging on the seat as well. Slide into the second row and you shall be disappointed as this row is a bit tight on space and the seat issn’t as comfortable as the front one. There are 2 LCDs at the back, but these are optional features. The boot too of the G63 is massive, it is good enough to carry a couple of chests in it. Though the parcel tray or rather a cover for the luggage is a bit flimsy for an AMG. The Mercedes G63 AMG is powered by a 5.5-litre V8 Bi-Turbo petrol engine that whips out 544 horses at 5500 RPM and 760 Nm of torque between 2000 – 5000 RPM. The engine is mated to a 7-speed AMG SPEEDSHIFT PLUS transmission. Floor the gas and the G63 pushes you back in the seat and flies ahead. The vehicle accelerates from standstill to 100 km/hr in just 5.4 seconds. The engine has a lot of grunt for sure and it feels very effortless to drive thanks to the way it has been tuned for power delivery. For driving at sedate speeds in the city, you just need to provide mild throttle inputs and the SUV maintains good speed. But who buys an AMG for driving in the city? We quickly hit the highway and floored the throttle only to be overwhelmed by the exhaust growl. The exhaust note is so addictive that we actually turned off the music and lowered down the windows a wee bit to hear it properly. The Bi-Turbo engine offers superior performance across the RPM range and the vehicle never runs out of power. The vehicle also gets an ECO mode, but hey, did you buy an AMG to use the ECO mode? Along with that, the gearbox offers the choice of three modes – controlled efficiency, sport and manual. We tried the controlled efficiency mode first. In this, the SUV provides lovely performance but upshifts a bit early on the RPM ladder. In the sport mode, the exhaust note becomes more pronounced and the G63 redlines away to glory. The manual mode basically enables the use of paddle shifters. The gearbox seemed to be a tad bit jerky in its operations though and not as smooth as we expected. The vehicle cruises comfortably at 100 km/hr at under 1800 RPM, it redlines at 6300 RPM and needs at least third gear to hit the ton. The Mercedes G63 AMG is pretty good off the road too. It gets three electrically engage-able 100% differential locks that make sure that the SUV has a go-anywhere capability. The differential locks ensure that each wheel on an axle as well as wheels on both axles have the same number of rotations each minute. The drive torque is directed to only those wheels that have traction beneath them. Talking about fuel efficiency, you really cannot expect much from a vehicle that weighs so much and also offers so much performance. We managed to extract 5-6 km/l with very careful and sedate driving and approximately 3-3.5 km/l with some aggressive driving. The SUV has a massive fuel tank though (96-litres) so it can go on for around 400 kms on a single tank. Just because the G 63 has the engine specs of a supercar do not expect this to handle the same way. The car is high so there would be body roll , and also the stiff suspension is meant more to take on the rough terrain and still manage to be able to do high speeds. This is one of the few SUVs with three differential lock which lock completely. Whether it is slush or rocks or smooth tarmac or your neighbour’s car who pisses you off, the G 63 can take on all with ease. Forget other cars even trucks and buses get out of the way. The steering is stiff, but that provides better high speed stability. The acceleration is quite responsive and the G 63 shoots forward with ease.The new AMG high-performance brakes deliver top performance in terms of deceleration, adjustable feed and endurance. All-round ventilated, perforated brake discs with dimensions of 375 x 36 millimetres at the front and 330 x 20 millimetres at the rear provide optimum thermal capability and outstanding deceleration values. 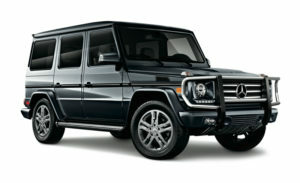 I was hoping for the 9G-Tronic system but may be we will get to see it in the upcoming new G 63 AMG. The Mercedes-Benz G-Class G 63 AMG Crazy Colour Edition has disc brakes on all wheels, and the ABS with EBD, Brake Assist System, Acceleration skid control system and electronic stability control system deliver perfect stability and control over all road and surface conditions. The safety feature of airbags for the driver and front passenger provides surround protection against front and side impact collisions. The neck pro luxury head restraints provide additional support, preventing whiplash injury in an event of collision from the rear. Sure the G63 AMG doesn’t rate very highly according to our parameters, since it isn’t an all rounder. There are more than a few shortfalls starting from the weight, the aged design, average ergonomics and a very high sticker price. Any logical car buyer with deep enough pockets will and should not buy the G63 AMG over any other luxury offering around the same price. You have got to be of the eccentric kind to pick one up, especially in the crazy colours it comes with. Because if you have the potatoes in you to give this SUV a full workout after paying for it, you truly deserve the ability it rewards you with. The G63 is a statement of a conqueror that arrives after the thunder of its V8.